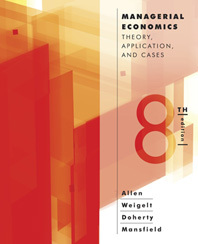 Welcome to the Student Studyspace for Managerial Economics, Eighth Edition. This site is designed to help you succeed in your course, offering Spreadsheet Exercises, diagnostic quizzes, chapter reviews, chapter outlines, and vocabulary flashcards, plus links to the Managerial Economics, Eighth Edition ebook. Flash Cards of each chapters' key terms are available for additional practice.